Girl I Left Behind Me, The – Brass Band | McGinty Music, LLC. 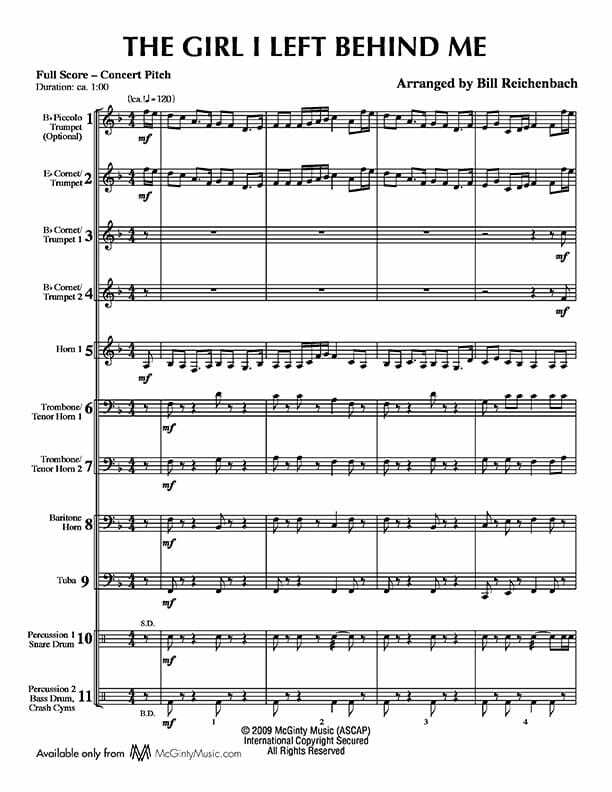 The arrangements in Bill Reichenbach's American Brass Band Series were written to showcase the brass band. These familiar tunes are all great audience pleasers and will be a welcome addition to your next concert. Bill and his band, playing on restored instruments from the 1870s, performed these charts at the Great American Brass Band Festival, Custer's Little Big Horn re-enactment and brass benefit concerts to name a few. Each arrangement has the parts numbered from the top down on both the score and the individual parts. For example, numbers 6 and 7 have parts for both trombone bass clef as well as transposing treble clef parts for tenor horns. All the optional versions of the same part have the same number, making it simple to have all the parts covered by making sure that you have someone playing all the numbers. Print all the parts or print only those you need. Upstate Brass Band (all Eastman School of Music students) with Kevin Michael Holzman, conductor, recorded this piece. The full version is downloadable and available at no charge. It's also available on YouTube.